Maria’s ring was designed once for a very special person. A strong person, intelligent and as beautiful inside as outside. From having created that piece with such care, it has become a very significant piece, representing union and strength. An infinite made of one single piece crossed and shiny or mat finished, won’t let anyone indifferent. Silver 925. 14 kt gold plated. 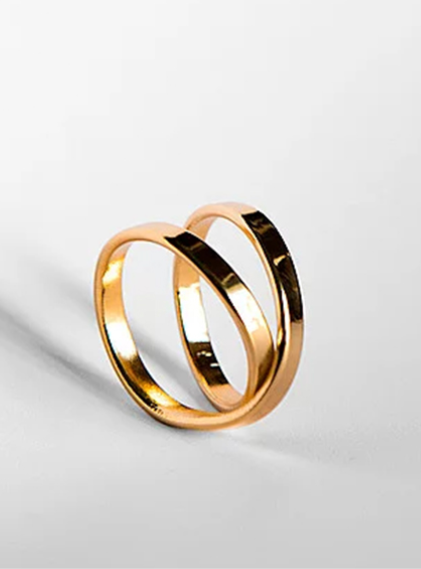 *If you would like the Maria ring in gold, rose gold or white gold, contact us. [description] => [:en]Ukiyo means "floating worlds" in Japanese. The Ukiyo ring is an abstract representation of this concept. A 18kt gold sculptural piece holding a black pearl. With a square mate texturized structure, encircling the finger leaving the pearl float on top. This piece can be made in different materials. Allow from 10 to 12 days to make the piece and have it ready to ship. [description] => [:en]The Angle ring from the Metalized collection, was created in Paris, inspired in the eclecticism of this monumental city, alive and modern. After some months living in the city, creating and designing pieces from a small atelier in Arts et Metiers, half the Metalized collection was born. Comfortable pieces showing sharp, asymmetrical and articulated shapes, ready to join your daily life, by day and by night. Silver 925 or 14kt gold plated. *This piece can also be available in gold, rose gold and white gold by demand. Contact: hello@nccjewels.com[:es]El anillo Angle de la colección Metalized, fue creado en París, inspirado en la eclecticidad de esta ciudad monumental, viva y moderna. Después de unos meses en la ciudad, diseñando y creando piezas desde un pequeño atelier en Arts et Metiers, nació la mitad de la colección Metalized, de formas angulosas, asimétricas y articuladas. Piezas cómodas, con presencia, listas para acompañarte de día y de noche. En plata 925 y también chapado en oro de 18kt. [description] => [:en]Mrauk-u, is a small town located in the west of Myanmar, it offers an amazing landscape with pagodas hidden amongst the wild nature. This ring is a homage to those marvelous lands. This small ring is worn in the upper part of the finger, its is adjustable to many sizes. One size. Made in distressed silver. [:es]Mrauk-u, es un pueblo situado al oeste de Myanmar que ofrece un paisage de pagodas entre naturaleza salvaje. Este anillo es un homenaje a esas maravillosas tierras. Talla única.